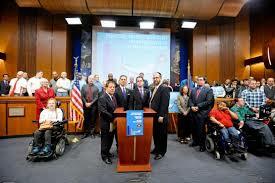 New York Sen. David Carlucci said Thursday he remains committed to restoring $120 million in budget cuts to nonprofit providers who provide vital services for New Yorkers with developmental disabilities as state legislators continue negotiations with Gov. Andrew Cuomo on his proposed cutback to the Office for People with Developmental Disabilities (OPWDD) despite reaching a tentative budget agreement last night. Both the Senate and Assembly recently passed budgets restoring the $120 million cut proposed by Gov. Cuomo, which when factoring in matching federal funds, actually constitute a $240 million reduction in services that the developmentally disabled depend upon for their safety, health and well-being. The nonprofit agencies facing a potential six percent cut in their budgets offer medical and clinical services, help developmentally disabled individuals find employment and live independently, and also provide support to families caring for disabled loved ones.